For the past two-three months ColdFusion has been increasingly targeted by attackers, as many have found out the hard way. Because my company Foundeo Inc. does a lot of work related to security on ColdFusion we have seen first hand a lot of interest in improving security practices among CF developers and administrators. 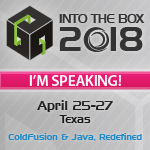 I also want to point out that Foundeo Inc. is a sponsor of cf.Objective() and will have a booth, so please stop by and ask your security questions or learn about FuseGuard and HackMyCF.